In less than two hours we arrived at camp in Carlton County where my 44 acres serves as a base for the chase. Camp Moose Horn, so named after the west fork of the river that rises from this spot, consists of two trailers and a mixed forest of aspen, sugar maple and balsam fir surrounded by tag alder swamps. 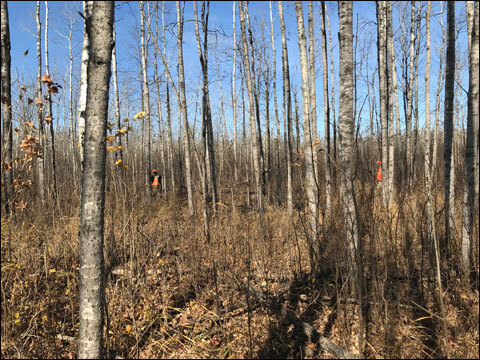 Five years ago I completed a forest management project on the land to benefit wildlife – completing smaller habitat improvements since then as well. 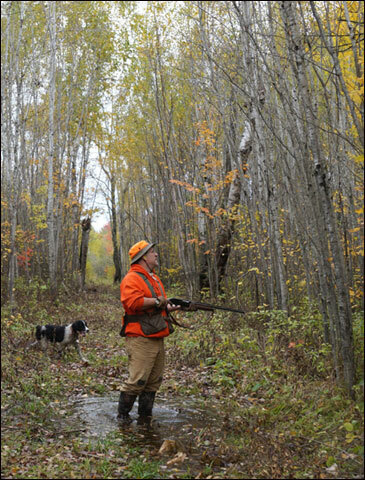 Ruffed grouse use of aspen forest peaks when the spindly, dense tree stands reach seven years old. 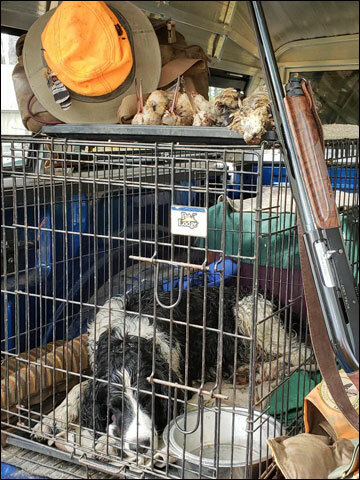 The author’s springer Hunter worked hard to help put three woodcock, a day's limit, and a grouse in the bag. We didn't find any grouse on the northern half of camp, so we crossed over onto a neighbor’s property (with permission, of course.) Hunter flushed a woodcock not five yards down the trail. It was a perfect shot, however it would have to wait another few days for that season to open. We continued to flush woodcock, all local birds since the migration had yet to start. Then about a half hour later Hunter started to bark in earnest, his 'tell' that he's on a hot scent. I picked up the pace, scanning intently for any sign of a flush. Soon, a mature bird (as gauged by its long tail feathers) launched from my right, crossed over the trail and straightened out. But just as I got a bead on it and hit the trigger, the grouse tacked right. My shot drew a few down feathers, but it takes more than that to drop this denizen of the boreal forest. The author watches closely for sign of a flush as his buddy pushes an aspen grove. 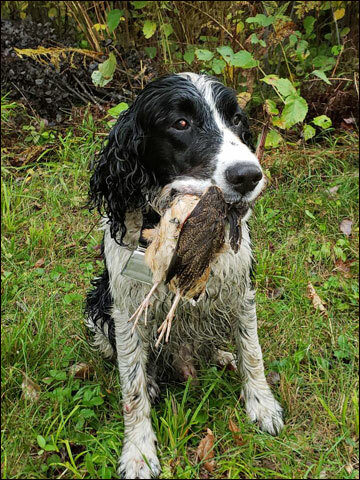 The author’s first ruffed grouse of the year. My first grouse of the season was a bird of the year, a good sign since it means there was at least some reproduction this year. Grouse populations rise and fall on a 10-year cycle, with officials suspecting last year was the cycle peak. There’s also worries about West Nile virus killing young birds. All in all, a good opener. We had 15 flushes in a few hours of hunting, a bit over half were grouse, the rest woodcock. The next week a buddy, Jared, and his English pointer Jackson joined me for round two. Woodcock season was open now and it didn't take long to put a few of the lil' russet fellers in the bag. This time we were in a state forest across from camp when Jackson went on point in some 'dog hair aspen,' that is, young, very thick aspen. The bird headed straight up through the trees my way and soon returned to earth! Jared scored another in the woods, again off a Jackson point. Hunter with the season’s first woodcock. Back on the neighbor’s land, Jared spotted a grouse flying low and landing on the trail up ahead. We pursued, and luckily, the bird broke my way for a close shot on the trail's edge. After a lunch of marinated wood duck chopped and fried with venison bacon provided and prepared by Chef Jared, my buddy headed home to his ever demanding job, wife and their brood of two young daughters. As a recently retired man of leisure, I headed back to the woods. Where else! It didn’t take long for Hunter to flush a woodcock from a slash pile at camp. The bird flew across the trail left to right, a shot I seldom miss. Soon Hunter had brought the plump hen bird to hand. Hen doodles are half again as large as the males. I snuffled her breast feathers for a whiff of her musky forest perfume. Pushing through an aspen/tag alder edge, a favorite grouse haunt. The next morning, Hunter and I pushed some young aspen on the south end of camp. He had flushed a woodcock from this very patch the week before. Sure enough, a bird flushed from the same spot. It streaked right over my head not 10 feet up in the clear of the trail. I wheeled right following its flight in a quick, but measured turn, got a lead on it and fired my 20 auto just before it made the forest cover. It was my first one-shot bird of the season. I was getting my swing-to-shot down pat! A few days later I heard some welcomed news: a hard freeze in the mid-20s was about to hit camp. 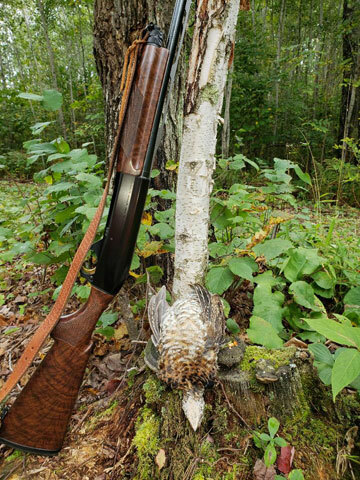 The grouse forest's dense leaves would soon hit the ground and clear the way for the season's 'best' shooting – a relative term when talking about the continent's toughest upland game bird, the explosive and acrobatic ruffed grouse. Herwig resides in White Bear Lake, Minnesota. 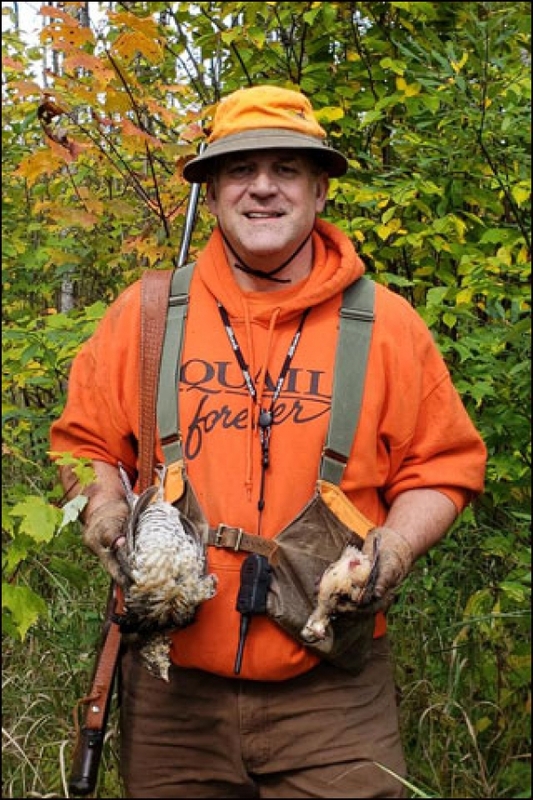 Herwig was editor of Pheasants Forever and Quail Forever magazines from 1998 to June 2018, when he retired.